Last year I wrote a post about Springtime bird attacks, and either I didn’t heed my own advice or the birds in my area are really bad this year, but last week I was attacked by a very aggressive butcherbird! For those who don’t know about this little ‘terrier’ of a bird, it’s an Australian native and about half the size of a magpie and usually grey or black & white in colour. Since being attacked by one last week I’ve done a little research on these aggressive little so-and-sos. 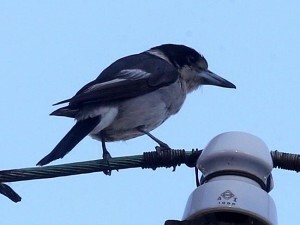 As well as having a hook at the end of its beak for stabbing prey (as seen in the photograph), the butcherbird has been described as the Hannibal Lecter of the bird world. It gets its name because it impales its prey on thorns and tree forks. These skewers support victims as they are eaten, or stored for later consumption. There’s a very aggressive butcherbird frequenting a well-worn cyclist route in my local area, right near Concord West train station and he’s drawn blood on many occasions (I say ‘he’ because it’s usually the male bird who defends the nest, not because I’m being sexist!). He got me from behind last week, clipping me on the chin with a his beak and drawing blood on three separate small cuts. And I’ve spoken to many, many others who’ve suffered the same fate. I decided that some action needed to be taken and contacted the local council who told me it wasn’t their problem. This prompted me to send a quick email to the local newspaper – The Inner West Courier which has run an article on this menacing little birdy. So I thought I’d re-run my bird swooping tips from last year….. Native birds such as Australian Magpies are highly protective of their eggs, nest and young and will often swoop at unsuspecting passers-by if they feel threatened. Other native Australian birds that are also common culprits include butcherbirds, kookaburras and plovers, but even invasive species like Indian Mynas can attack at this time of year. Only a small proportion of birds swoop on people and these often have a preference for a few individuals that the birds recognise or certain types of ‘targets’ like cyclists. A magpie will only defend its nest within a ‘defence zone’. For cyclists, this is usually an area within 150 metres. Almost all swoops on people are carried out by male birds defending their eggs and chicks, which are in the nest for about six to eight weeks between July and November. They will usually target the head but learn that helmets are there to protect the rider so start to side swoop attacking ears, cheeks and even eyes. Most people get more injury from falling off the bike or into oncoming traffic than the actual bird attack so it’s important to stay calm and keep riding. Putting cable ties on your helmet that stick up to deflect the swooping bird may or may not work. I’ve found no conclusive evidence in my research and frankly I’d rather take the risk than look like a dork.